After a long time tricksage is posting an awesome Gprs trick for Vodafone user using proxy trick on Android phone, this trick is working fine in kerela circle since a week and still working so hurry guys, try at your place and we hope it will also work for you too. 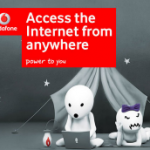 so to enjoy free vodafone 3g trick on your android simply follow the below given steps. we always recommend you that try all Gprs or network related tricks at low or zero balance to avoid deduction. Try at your place and comment about working. if you like this post then immediately like our fb page for more such tricks and tips..